The story behind the quote: Wow, when it comes to comics, I seem to either go to Batman or Spider-Man… but this is a bit different since it isn’t the hero that gives the quote. Rather, it’s the love interest of Peter Parker, Mary Jane Watson. We have to get into a lot of backstory regarding this quote to really get the full impact of the wisdom from it. Prior to her first (official) appearance in the comics, she was just this faceless girl that Aunt May kept on trying to set Peter Parker up for a date (initially mentioned in Amazing Spider-Man #15). Peter kept blowing it off since he assumed that, since his aunt liked her so much, he wouldn’t really like her. This actually kept on for a really long time and it became somewhat of running joke of the series. 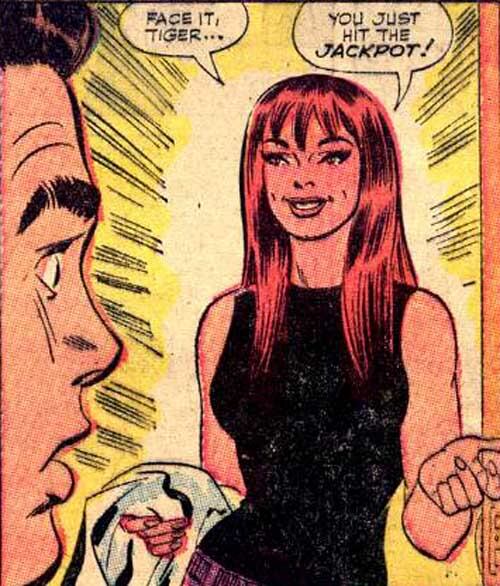 Finally, in Amazing Spider-Man #42 (around two years after she was initially mentioned), Peter does meet Mary Jane, who turns out to be a bombshell of a red-head who jokingly mentions how lucky he is. Geek wisdom: You shouldn’t be afraid to try new things once in a while. Sure there’s going to be a chance that the experience is awful. However, unless you try it, you’ll never know if its something that’s plain god-awful or something given from God. Imagine if Peter Parker never met Mary Jane. He wouldn’t have had met the love of his life. Remember, you may hit the jackpot, too, if you try something new.